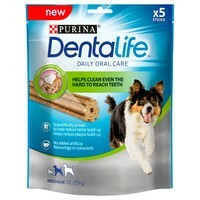 Purina Dentalife Dental Chews for Medium Dogs have been developed with a chewy, porous texture that contains thousands of air pockets, to help clean even hard-to-reach back teeth. Featuring a unique shape that has 8 distinct ridges, the chews will deliver a breakthrough clean right down to the gumline that has been scientifically proven to reduce tartar build-up. The chews are low in fat and designed for daily use, and everyday chewing means more time cleaning.